You have probably heard of, and maybe even used, almond milk, soy milk, and coconut milk. But have you had cashew milk? It's one of the less popular nut/seed milks out there, but it's gaining some influence. I personally hadn't had cashew milk until I made this very batch! Yes, this is my first glass of cashew milk. And let me tell you, it was delicious! Oddly enough, I am not a huge fan of cashews themselves. But when it is turned into nut milk, I find that it tastes remarkably like milk. I didn't have to add any flavors or sweeteners to it at all. I could drink this stuff by the glass! If you saw my post on almond milk, then this will all look and sound very familiar to you... Making this stuff is so darn easy and once the nuts have been soaked, it takes just minutes. Before work, I measured out two cups of cashews and placed it in a bowl then covered them with water. When I got home, the cashews were nice and soft. I rinsed the nuts and put them in my food processor. I poured over four cups of water and sprinkled in some salt. Then I let the food processor do all the work. I processed the nuts and water until the cashews were finely ground and the water was white and opaque. Using my handy dandy nut milk bag (read more about it here), I strained out the nut pulp which left me with smooth and delicious cashew milk. Looks good, right? 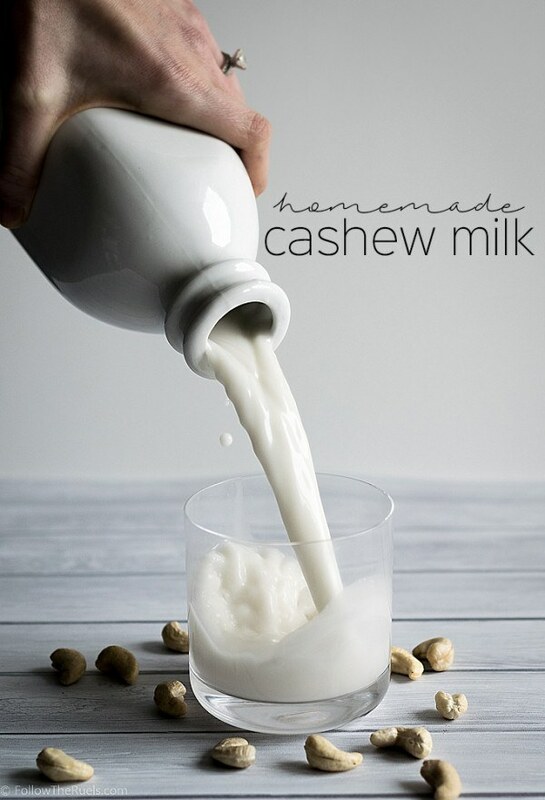 If you are a nut milk user but have never tried making your own, or have never tried cashew milk, I encourage you to do both! Homemade nut milk is not only easy, but it is so much better for you than the store bought stuff. The commercial nut milks have so many additives and chemicals in them. You know what that glass up there has in it? Cashews, water, and salt. So go and make your own! I promise, you will not be sorry! Soak cashews in water over night, for at least hours until plump and soft. Rinse the cashews and shake off any excess water. Place cashews in a blender then pour in 4 cups of water and sprinkle in a pinch of salt. Blend until cashews have been ground into a pulp and water is now opaque. Place a nut milk bag over a bowl. Pour mixture into bag and strain the milk. Press out any excess milk until the pulp is almost dry. Store in an air tight container for up to a week. Shake well before using.